It's been a while since I met Keigo-kun last time. This time I found him speak a word "Bye Bye". I was impressed with progresses in expressing himself to people surrounding him such as...."let's play with this particular toy"...or "Read this book of illustrations aloud to me". Everytime I visit kids, they surely outgrow. Since a daughter of Hosono family happened to take a day off from work then, three of us could go for a walk. 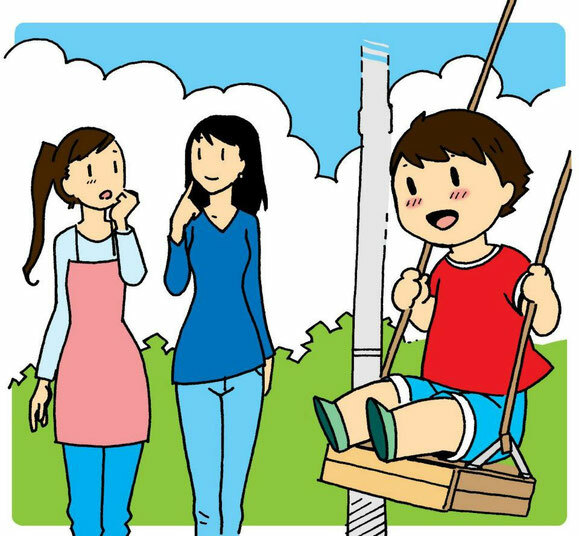 We enjoyed swinging together---actually Keigo-kun now got knack of swinging himself. I was also impressed to see how he strongly climbed up a ladder of slide now.